Accessories « Global Market Insights, Inc. The changing preferences of consumers toward the comfort, appearance, & performance of vehicles has fueled automotive aftermarket to quite an admirable extent. As customers focus toward leading a luxurious lifestyle, complete with personalized vehicles for commuting in style, courtesy – increasing disposable incomes, automotive aftermarket is likely to witness lucrative gains in the years to come. The subsequent wear and tear of existing automobiles will quite overtly lead to car owners wanting to replace old parts, enhance the vehicle’s appearance, and replace the car’s internal components for improved efficiency and safety. Eventually, this would propel the demand for state-of-the-art aftermarket parts, augmenting the commercialization landscape of automotive aftermarket. The ever expanding automotive sector is one of the most crucial drivers of the global automotive aftermarket. Over the last couple of decades, the demand for automobiles has only skyrocketed across the developed and developing economies. According to estimates by OICA, LCVs and passenger cars accounted for a sales figure of close to 86 million units in the year 2017 – apparently an upsurge of 2.4% when compared to the previous year. As the sales of commutable vehicles continue to increase and the demand for afterparts experiences an uptick, the remuneration portfolio of automotive aftermarket will undergo a significant change, as per experts. Another trend that has lately made its presence felt in automotive aftermarket is the rising deployment of eco-friendly techniques in automotive manufacturing. Driven by a stringent regulatory landscape pertaining to environmental safety and the concerns stemming from rising carbon emissions, the demand for sustainable, alternative automobile parts has considerably increased, thereby driving the global automotive aftermarket share. 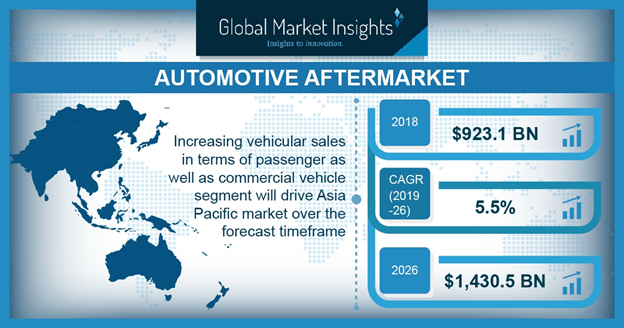 North America, primarily driven by the United States and Canada, has been one of the most significant growth grounds for the global automotive aftermarket, which principally can be attributed to the expanding automotive industry in the region. The continent has been a witness to an upsurge in the production of new vehicles and the enhancement of older ones. Furthermore, the region is a powerhouse of technological advancements in automobile production and upgradation, which is likely to generate novel opportunities for aftermarket companies in the years to come. North America is also remnant of a consumer base that demands increasing vehicle personalization, Bluetooth connection, digitization, and other interesting automotive electronics. The incorporation of advanced accessories is thus likely to drive North America automotive aftermarket. Incidentally, the region accounted for 30% of the overall automotive aftermarket share in the year 2017. Another pivotal factor likely to drive North America automotive aftermarket over the forecast period is the improved fuel economy that would quite overtly, augment the average miles that the customer drives, which would lead to increased wear and tear in vehicle parts. This would eventually fuel the requirement for aftermarket spare parts in the continent, stimulating North America automotive aftermarket industry trends. Technological advancements have indeed had a major impact on the overall automotive aftermarket in the last half a decade. The surging demand for electrification and installation of software has been touted to generate novel avenues for aftermarket workshops and suppliers. The popularity of ADAS, infotainment systems, and telematics will also serve to augment the demand for technologically developed parts, that would help stimulate automotive aftermarket industry growth in the years to come. Some of the most noteworthy players in automotive aftermarket fall along the likes of the 3M Company, Akebono Brake Corporation, Delphi, Denso, Continental AG, Robert Bosch GmbH, ACDelco, ASIMCO Technologies ltd., Federal-Mogul, Magneti Marelli, and more. In a bid to expand their reach across myriad geographies, these leading contenders have been rather proactive in adopting business growth tactics such as strategic collaborations. Citing an instance of the same, nearly a couple of years back, industry player Faurecia inked its third JV with its partners in Iran with an intention to consolidate its presence in the regional automotive aftermarket. This entry was posted in Automotive & Transportation and tagged Accessories, Auto Parts Stores, Automobile Dealerships, Automotive Aftermarket, Automotive Aftermarket Companies, Automotive Aftermarket Industry, Automotive Aftermarket Market, Automotive Aftermarket Size, Automotive Aftermarket Trends, Belt, Brakes, Car Exteriors, Car Interiors, Clutch, Commercial Fleets, Discount Department Stores, DIY, Electrical & AC Parts, Electrical Parts, Exhaust, Filters, Garages & Service Stations, Government, Lighting, OEM Factory Fill, Professional, Professional Outlets, Quick Lubes, Replacement Parts, Sales Outlet, Suspensions, Transmission, Wiper Parts. The deployment of modern construction technologies for a luxurious, healthy lifestyle has been rapidly pushing window automation market trends in the last few years. Tech advancements such as augmented reality and IoT are proliferating the construction domain at a robust pace, creating new opportunities for window automation industry players. The incorporation of intelligent control systems in newly installed windows has today proved to be one of the most advantageous technological additions across residential as well as industrial sectors. Pertaining to their sustainability and lesser energy consumption capability, the demand for automated windows has only been escalating lately. Ever since the advent of the smart era, smart homes and smart cities have become somewhat of a universal trend, prompting regional government bodies to come up with a supportive regulatory framework as well as suitable initiatives to aid the implementation of smart cities. In consequence, this would push the demand for automated components such as doors and windows. One of the primary factors behind the incorporation of these systems however, is the fact that they help reduce excessive energy consumption. Across Western Europe for instance, 40% of the overall energy consumption is for buildings. Being essentially fuel-based, this proportion leads to severe CO2 emissions, escalating the demand for automated windows and doors, given that they help lower these emissions. The deployment of automated windows for optimized energy usage and reduction of carbon emissions will thus impel window automation market share. One of pivotal challenges construction behemoths are facing today is the onslaught of fresh air in the living space. This fundamentally involves combating with environmental conditions such as indoor temperature, wind, rain, snow, and carbon dioxide levels, leading to the necessity of advanced sensing systems to be integrated in windows. In recent times, these systems are being developed with highly advanced sensing technologies that are far more efficient and reliable than their predecessors. In order to make these windows smarter than before and ensure that they react appropriately to the occurrence of natural calamities, temperature sensors, and motion sensors are also being incorporated during construction. Driven by the increasing use of innovative sensing solutions, sensors & detectors based window automation industry size is expected to be pegged at USD 950 million by the end of 2024. The growing popularity of automated windows among the masses has considerably encouraged window automation industry contenders to come-up with innovative solutions. Recently for example, one of the leading window and door manufacturers, Kolbe Windows & Doors showcased its highly innovative portfolio encompassing inswing doors and awnings with automated activation, sliding patio doors, and numerous modern, upgraded window designs at the NAHB IBS (National Association of Home Builders International Builders’ Show). Having successfully integrated modern technologies into its existing window and door product ranges, Kolbe has set a benchmark for other giants in window automation market. The use of advanced systems for ensuring building and occupant safety is now becoming mandatory, considering the occurrence of life-threatening hazards. Across numerous geographies, governing authorities have mandated the installation of smoke ventilation solutions for operating windows automatically in case of an accidental fire. The increasing deployment of building safety regulations will thus emerge as another contributing factor toward window automation market growth. Of late, escalating living standards and the increasing need for building safety have generated considerable opportunities for window automation industry contenders. With evolving developments in smart technology, the demand for next-generation components such as motion sensors and IoT based control panels will observe an appreciable upsurge, drastically transforming window automation market outlook. Taking into account the ease of functionality of these systems, governments bodies have also been encouraging residential building developers to deploy automated windows in their projects. 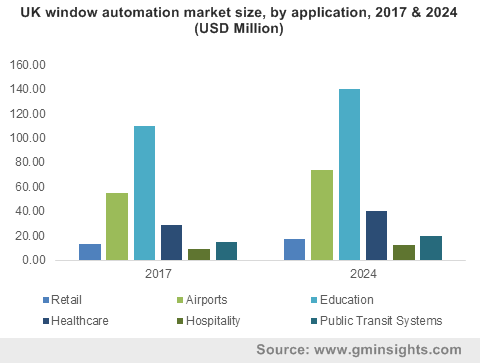 In essence, powered by a supportive regulatory framework and a strong technologically-aligned industry background, window automation market size has been forecast to register a CAGR of 6% over 2018-2024. This entry was posted in Sustainable & Smart Technologies and tagged Accessories, Actuators, Commercial, Component, Contractors, Control Panels, Detectors, Electric, Facade Builders, Hybrid, Industrial, Mechanical, Motors, Product, Profile Houses, Residential, Sensors, Switches, Window Automation market, Window Automation Market Analysis, Window Automation Market Forecast, Window Automation Market Growth, Window Automation Market Report, Window Automation Market Research, Window Automation Market Size, Window Automation Market Trends, Window Manufacturers. Regarded as a one of the rapidly progressing fraternities of the life science domain, cell line development market has established itself as a major business sphere of recent times. With tissue and cell-based assays rapidly swapping animal studies, researchers are increasingly becoming dependent on cell study to demonstrate greater biological relevance. As per the data put forth by the World Health Organization, neurological disorders and their consequences are anticipated to affect more than one billion people worldwide. This data is evident from the rising aging population and lack of effective treatments – a factor also underpinning the necessity to develop new assays to advance research and develop know-how with regards to the mechanism of these diseases. Given the fact that both industrial and research concerns are demanding advanced & better cells for developing novel vaccines, biosimilars, drug, and therapeutic proteins it comes as no surprise that the global cell line development market has bright growth prospects. A conjecture substantiating the same is of a report compiled by Global Market Insights, Inc., that claims the global cell line development market to become a massive 7.5-billion-dollar industry by 2024, a substantial up from USD 3.3 billion in 2017. When it comes to the vast utilization of the cell line development technology, Berkeley Lights Inc., is one protuberant industry magnates that has developed a platform to address the unmet research needs in Cellular Immuno-Oncology, BioPharma, and Autologous T-cell Therapies. Introduction of Beacon platform by this company has undeniably changed the overall competitive dynamics of cell line development industry. In fact, it has been observed that several other market players are leveraging Berkeley Lights’ state-of-the-art technology to further dive deeper into cell line research. According to reliable reports, Berkeley Lights, Inc. (BLI) launched its first commercial platform – Beacon™ OptoFluidic Platform in December 2016. This platform is ideally suited for direct B-cell antibody discovery and cell line development workflows. Experts deem that the flexibility of this platform has allowed researchers to automate biological processes and develop new applications to align with specific requirements. In short, the Beacon platform has enabled efficient monitoring, visualization, and tracking of cell to cell interaction and single cell manipulation across thousands of cells into a nanofluidic chip. As a result of this breakthrough technology, customers and other cell line development industry players could accelerate the delivery of actionable results and reduce hands-on time. Taking into account the Beacon platform’s ability to interact with cells in novel ways, BLI’s prominence in cell line development industry has indeed strengthened. Recently in January 2018, BLI announced that Shire is implementing the Beacon Platform to accelerate their CLD process. Reports reveal that the company’s decision was based on an experiment and study that equated their existing cell line development workflow to the workflow results obtained using Beacon. BLI in October 2017 announced that it will be working with the global pharmaceutical industry player Daiichi Sankyo to focus on creating CLD workflow efficiencies and fast tracking the drug development process. According to sources, the program includes evaluating and predicting the stability of clones, establishing monoclonality, and screening a pool of recently transfected CHO cells. In a recent news snippet released in January 2018, it has been reported that Pfizer is leveraging BLI’s Beacon platform to advance its gene editing programs and monoclonal antibody discovery. Teva Pharmaceuticals Australia, recently announced that it will be installing Beacon for its CLD and antibody discovery programs. Bayer Inc., is another in the line that has announced a strategic project with BLI to innovate and accelerate research. The pharmaceutical giant Novartis is also not far behind in implementing the Beacon platform. In fact, reports reveal it to be an earlier adopter of this technology and to consequently have secured its position in the dynamic cell line development market. Overall a common thread that runs through all the aforementioned trends is BLI’s rising preeminence in the global cell line development industry. The flexibility of the Beacon platform has not only allowed BLI to strengthen its roots in this industry by continuously aligning with its partner’s requirements but has also significantly aided other emerging cell line development market players. What is noteworthy about these prospective trends is that they are deemed to be extremely important for other cell line development industry players in designing their growth tactics to sustain in the competitive terrain. For the record, other prominent companies partaking in cell line development industry share include GE Healthcare, Thermo Fisher Scientific, Lonza Group, Sigma-Aldrich, Sartorius AG, Progenitor Cell Therapy, LLC, and Samsung Biologics Co., Ltd. This entry was posted in Healthcare & Medical Devices and tagged Accessories, Amphibians, Bioproduction, Bioreactor, Cell Line Development Market, Cell Line Development Market Share, Cell Line Development Market Size, Centrifuge, Consumables, Continuous Cell Line, Drug Discovery, Equipment, Hybridomas, Incubator, Insects, Mammalian, Media, Microscope, Non-Mammalian, Primary Cell Line, Reagents, Recombinant, Storage equipment, Tissue Engineering, Toxicity Testing.